After lots and lots of lurking in other people's build threads, I figured it was time to begin a build thread of my own. I started with a bone stock 2005 Chevy TrailBlazer. While it's not what you would think of for a expo platform, it comes well equipped from the factory. The final product of this build will transform this grocery getter into a capable off road vehicle that can support me, my wife, and my friends on our long weekend trips off road. My trailblazer is not only trimmed with nice bells and whistles like XM radio, heated leather seats, and a sunroof, but it has a good foundation too. It's built on a fully boxed frame (no unibody here) with a 275 hp I6 engine (decent fuel economy). 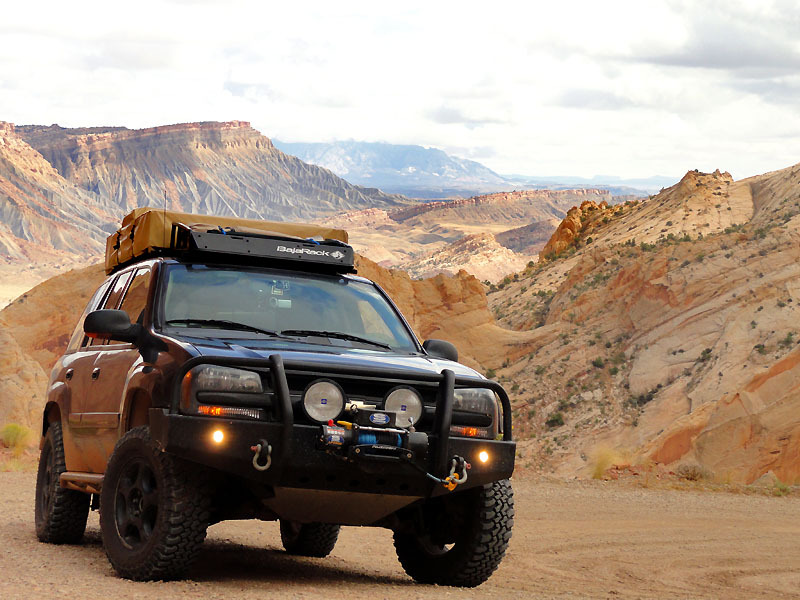 The drive train is headed by an NVG 226 transfer case, which gives 2HI, Auto4WD, 4HI, and 4LO with a 2.71:1 crawl ratio. 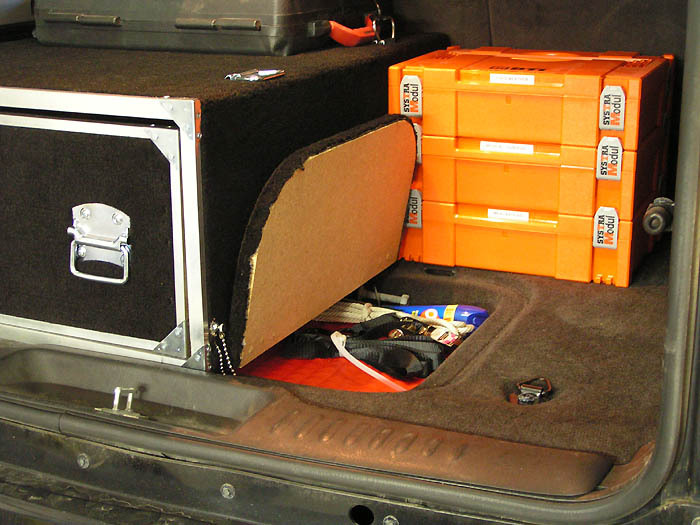 The rear axle comes (not standard) equipped with an Eaton auto locker which works quite well. 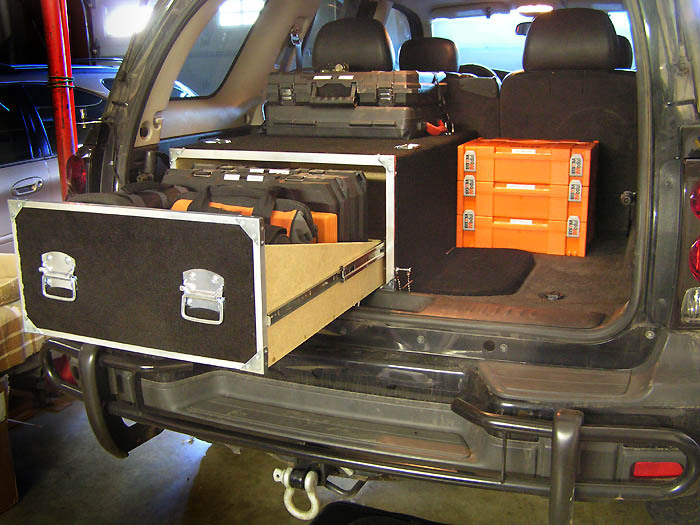 Back when I first started modifying my truck, I decided to 'protect' the vehicle with some brush guards. Luckily I made the smart choice when it came to manufacturers. 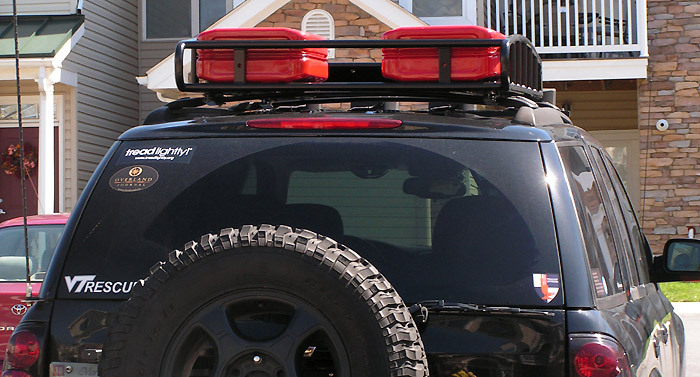 There are a ton of brush guard makers out there, from $100 to $500. 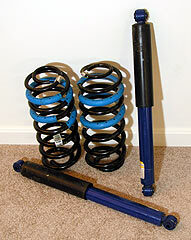 After examining the options, I went with a front and rear guard from WAAG. 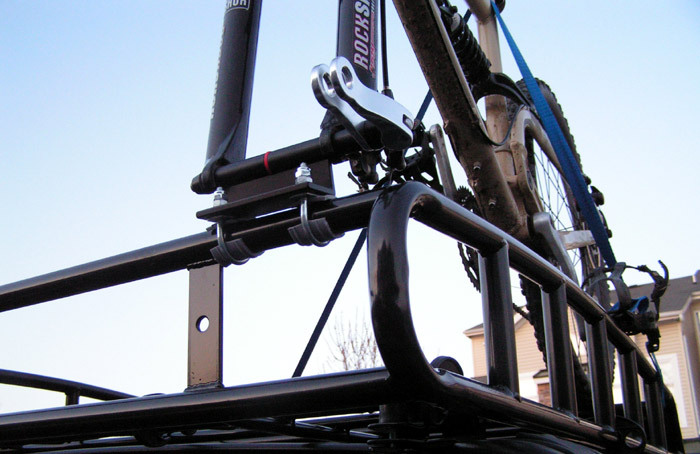 The WAAG mounts through the existing bumper holes, and still allows the user to retain use of the stock tow hooks. 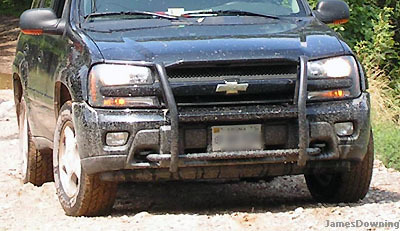 The front guard is stronger and more stable than others on the market because it also mounts above the bumper. 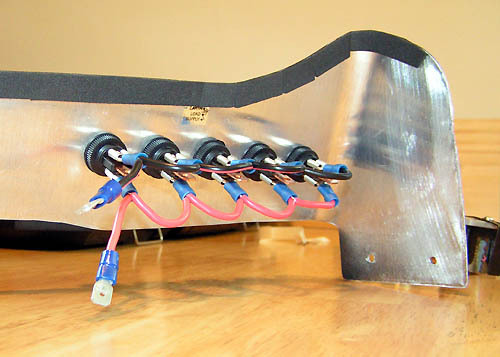 This gives it a stable platform for mounting the heavy Hella 4000s. After reading up on the different beams that Hells offers for these lights, I chose the cornering beam. I absolutely love the spread of light, which is perfect for night wheeling. My only negative comment for these lights is that they gobble up water when they are submerged (hey it happens, right?). They are not sealed where the bulb enters the lens housing. So they resist splashing well, but dunking is a different story. 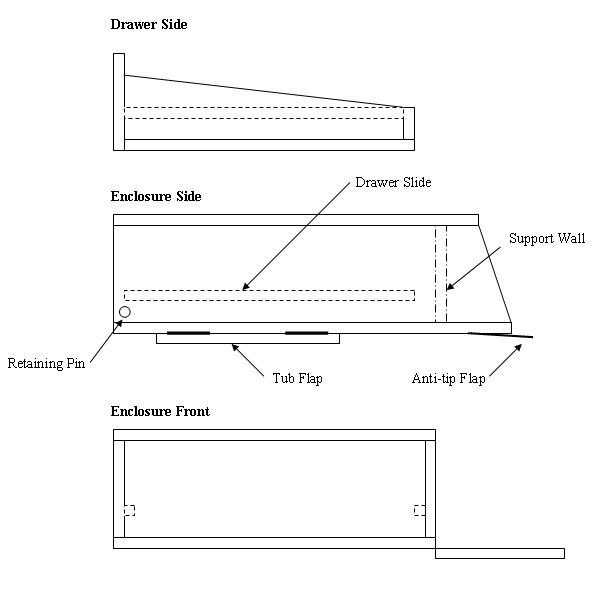 They have a modular design though, and can easily be taken apart to dump out the water. 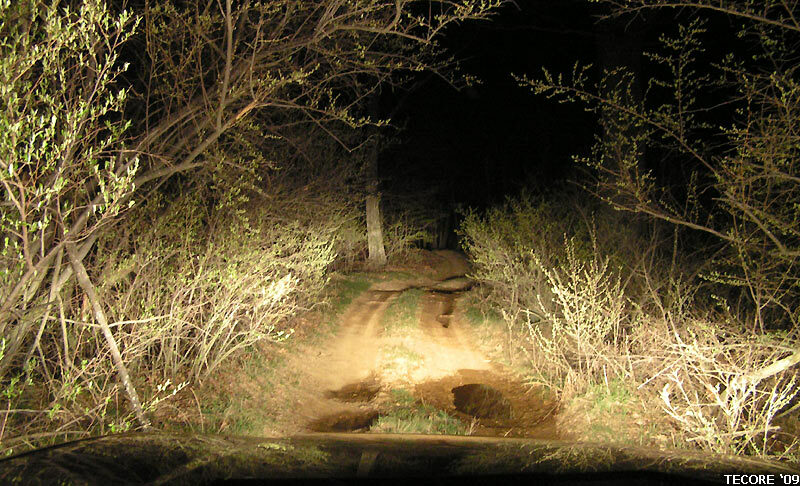 The problem with low headlights when off road is that they can cause you to misjudge bumps and crests. They throw long shadows that can make bumps look deceptively large, or make ruts look deceptively deep. The only way to fill in these shadows is to have light above the line of sight, so yep, that means roof lights. Currently I have a very simple, cheap, yet fairly effective rack of tractor lights ($20 a pair) mounted to an aluminum extrusion. They are low enough that they cause minimal drag, yet bright enough to fill in the shadows. I'd eventually like to replace them with some decent lights, as I have learned... you get what you pay for. Now comes the fun stuff. It was time to give the grocery getter some stilts. I had made a few trips at stock height, but was either scraping my frame on rocks and mud, or I was in fear of scraping the frame on rocks and mud. So some adjustments were in store. Since the truck is not only a daily driver, but also the trip truck, gas mileage was somewhat important, so I wanted to make the truck as capable as possible while maintaining decent fuel mileage. There are limited options for lifting a TB, so I went the BDS route. 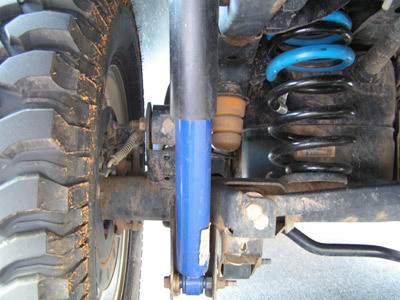 They have a body lift and a suspension lift, both 2". 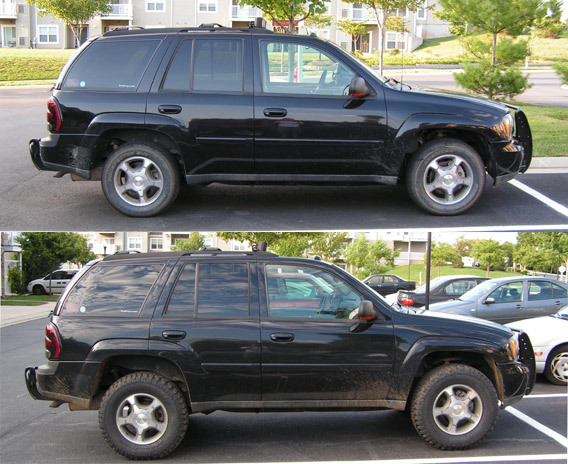 I decided the cost of the body lift was not worth the minimal benefits, so I stuck with only a 2" suspension lift (and I have yet to be thwarted on the trails I run). 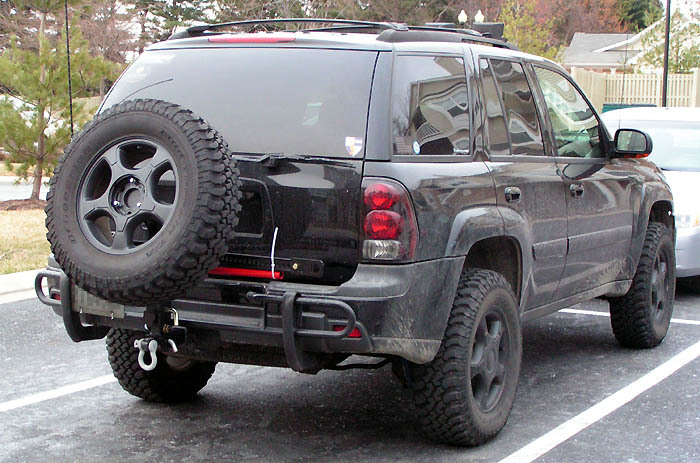 The 2" lift spacers all around was supplemented in the rear with z71 Tahoe springs. 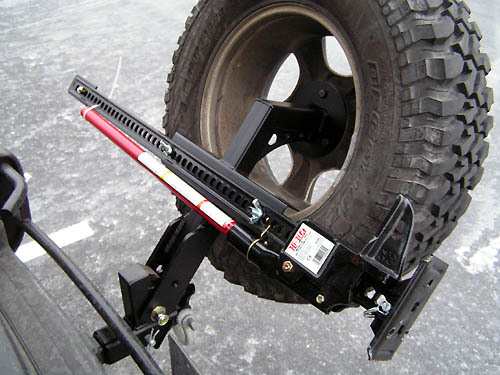 These added another 1.5" in the rear only and increases the payload capacity (critical when you're carrying a good bit of camping and recovery equipment). Of course it's not entirely that simple, but I will spare the nitty gritty details (see my website for those). For a tire choice, I went with the tried and true BFG T/A KMs. I found an excellent deal on 32"ers and have not had a single complaint since. Very cool - this is the same direction I'd like to take my Silverado. 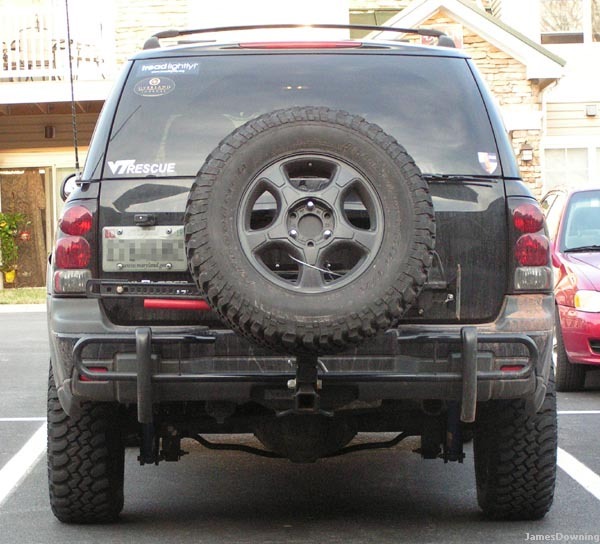 I'm looking into the WAAG front guard after seeing yours as it appears to actually protect the nose, isn't some god awful mess of chrome, and I really can't justify the $800-$1,200 for a full bumper. 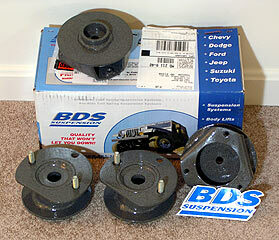 Do you have any front recovery hooks or mount points now? Two words....good job! 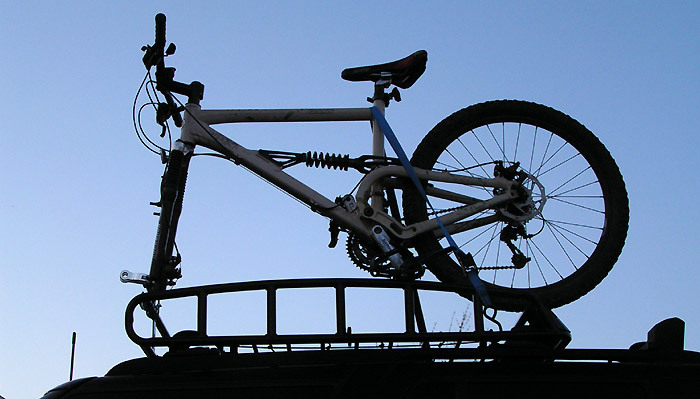 I like the versatility of your ride. I too am in early stages, mostly planning at this point of a similar build. It's Silverado half ton 4wd 2008 model. Well I guess it's not too similar but anyway the outcome will be geared towards versatility like yours. 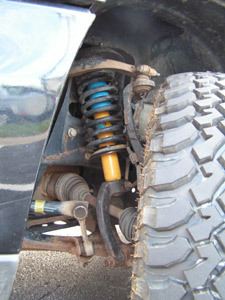 Check out my posts if you have time and let me know what ideas you have for suspension in particular as this is giving me the most difficulty right now. Again great build on a unlikely platform! 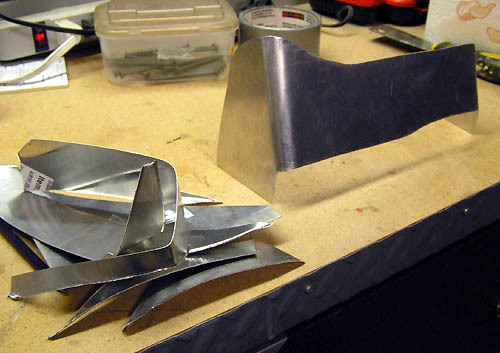 I'm looking into the WAAG front guard after seeing yours as it appears to actually protect the nose, isn't some god awful mess of chrome, and I really can't justify the $800-$1,200 for a full bumper. The WAAG is the best guard out there (IMO). 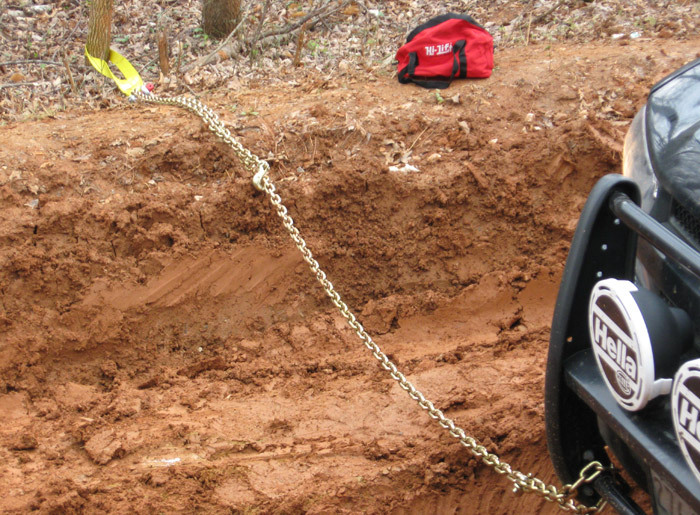 Mine has protected my lower bumper a few times when going up steep embankments or when coming off deep cross ruts. I've even used it for a side pull when I was stuck in a deep muddy rut a few months ago (see below), so it is quite stout. 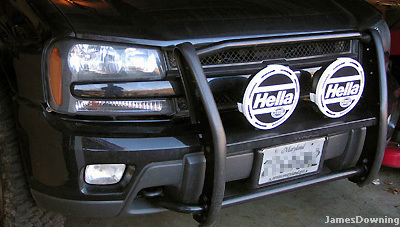 However, I primarily got it as a solid mounting location for the Hellas, and it will be replaced soon with a full bumper. My truck came with stock front tow hooks. They are however a very open design, and I really don't trust them much (straps can fall off easily). This is a big push for the new front bumper. 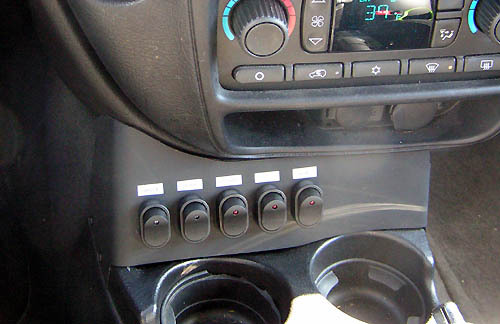 I needed a good place to mount my growing number of switches, and I didn't like cannibalizing the panels of the truck. I have since replaced the LEDs for all red ones. I had originally had them color coordinated based on function, but the blue was WAY too bright for night driving. Since my off road driving has been getting slightly more intense, I wanted the assurance that a matching spare tire can provide. The decision had to be made on where to stow it. There are two real options, roof or rear. After reading many warnings of the dangers of adding too much weight to the roof, I decided to find a way to mount it on the rear. However, I didn't like how it the tire stuck out so far, how it covered the rear glass, the weight, nor the price. So I hunted around a little more and found CBI offroad fab. 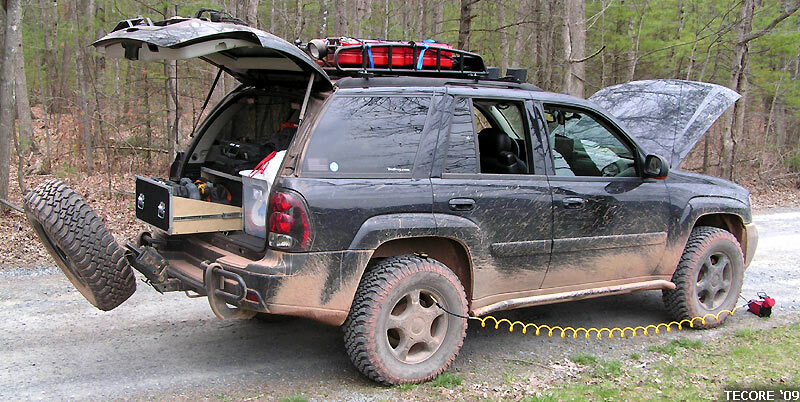 They specialize in toyota modifications, but they also make a lay-down tire carrier. The price was right, and they were built to the customers specifications. Nice build man so far. Good choice of vehicle I might add. Looks real good. After going on a few longer trips, I found that I needed some extra storage. The inside of the truck was getting full (especially if I brought more than one passenger). 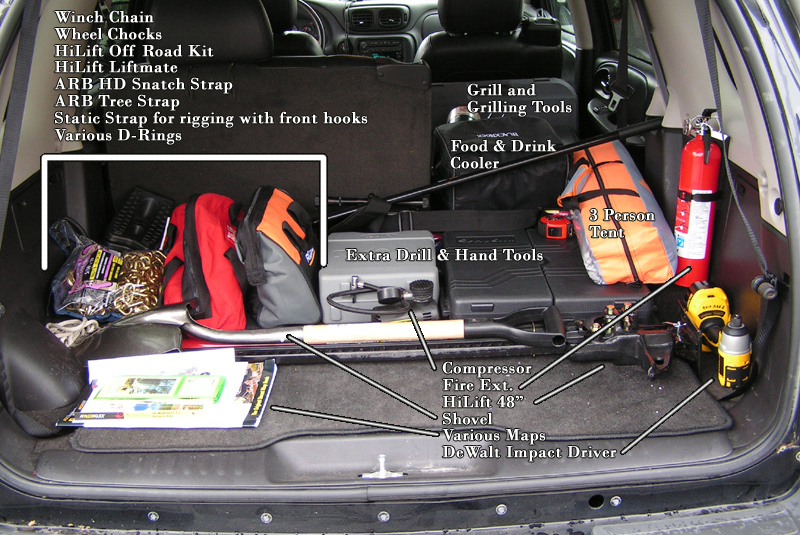 I also needed a place to carry extra fuel in order to extend my range, and to carry my mountain bike (and maybe a kayak in the future). So after shopping around I decided to indulge myself with a BajaRack. 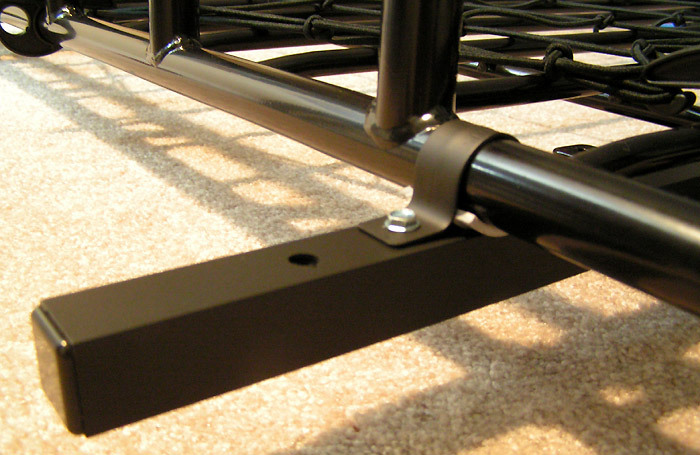 At first I used the mounting system that came with the rack (below). It would be fine if my truck had a different roof crossbar, but after I had loaded it down for a test run, I found that the stock crossbars just weren't holding up like they should. Wedco fuel cans in place but not strapped down. This was a picture from a test fitting I did. 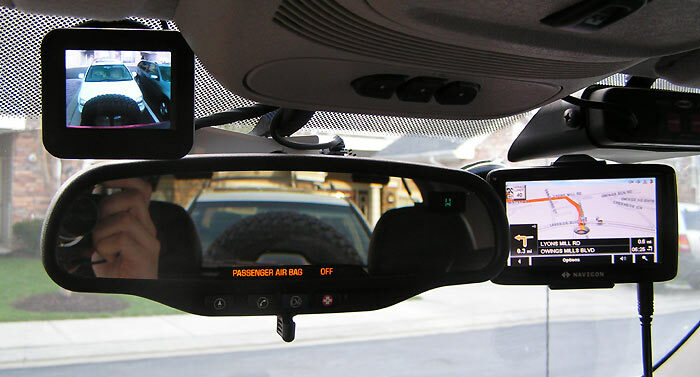 The mini screen is mounted above the rear view mirror. Instead of wiring it into the reverse circuit, I have it controlled by a small switch on the side of my previously posted switch panel. Haha, it's actually a reasonably priced mod (relative to the other mods) (~$80). 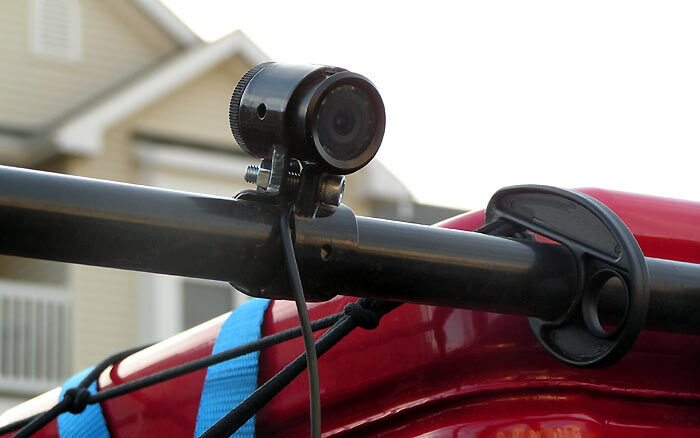 The camera and LCD are part of a package by Pyle called the PLCM25. I liked it because the LCD was small (2.5" diagonal), the camera was made for reverse (image is flipped left-right), and has night vision capabilities (not great). The camera was made for flush mounting, so I had to find the offset 90degree bracket on Mcmaster. Luckily both the camera and my rack have roughly a 1" OD. I waterproofed (more like water-resistified) the back end of the camera with some superglue. I still get some fogging after super heavy rain. As a final word of caution... make extra certain not to reverse polarize the LCD screen wires (black wire and black wire with white line... I figured the all black wire was ground... wrong...) or the screen will transform into a 2.5" smoke bomb.